In his article “Why Actors Love to Play Churchill,” published in the New Yorker, Anthony Lane considers the many actors who have played Winston Churchill on film. He comments that “If you are an actor of some eminence, naturally blessed with a mien like a full moon, it seems inevitable that, once you have attained the requisite age and girth, you will be asked to play Winston Churchill,” but concludes “The best person at playing Churchill, in the end, was Winston Churchill himself.” The article is available here. The December issue of the Churchill Bulletin: The Newsletter of Winston Churchill has been released. It includes articles on the opening of a new exhibit on Churchill aboard the Queen Mary in Long Beach, California, the honoring of the 143rd birthday of Sir Winston Churchill in an event at the Capitol, and a new exhibit on Clementine Churchill at Chartwell. Also, included is a review of Nicholas Shakespeare’s Six Minutes in May: How Churchill Unexpectedly Became Prime Minister. The newsletter is available here. In 1911 Great Britain introduced national compulsory unemployment, albeit restricted to just three trades. It was the first country to ever do so. 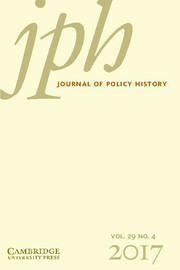 In the article, “The Origins of Unemployment Insurance in Edwardian Britain” published in The Journal of Policy History, Tomoari Matsunaga (Yokohama National University) studies the motivations of the policymakers responsible for the introduction of the scheme, including Winston Churchill as president of the board of trade. The website of The Journal of Policy History is here. Winston Churchill took a three-month vacation to North America in the summer and fall of 1929, a little known event in his long career. In the company of his son Randolph, his brother Jack and his nephew Johnny, he toured Canada and the United States. Notable are Churchill’s meetings with political, business, newspaper and entertainment figures (President Hoover, Prime Minister Mackenzie King, Bernard Baruch, William Randolph Hearst, Marion Davies and Charlie Chaplin) as well as his visits to such landmarks as the Grand Canyon, Lake Louise, Niagara Falls and Yosemite. For more information on my book describing Churchill’s 1929 visit, click on the book cover above.